Well, here we are at the penultimate novel in Zola’s Rougon-Macquart cycle, and what a magnificent novel La Débâcle has turned out to be. 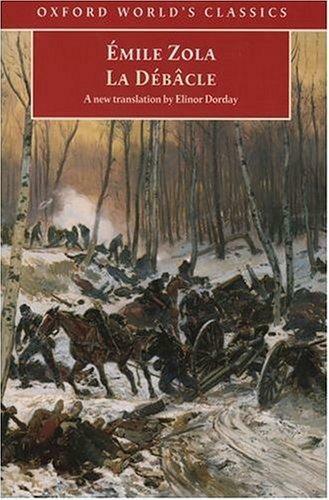 Often compared to Tolstoy’s War and Peace it tells the story of how, in Bismarck’s quest to unify a muddle of German states into a united country, he outmanoeuvred the French military and humiliated them in the Franco-Prussian War of 1870. Under his leadership, Germans overran Alsace and Lorraine, besieged Metz, captured Napoleon at Sedan and triggered the fall of the Empire, which led to the Paris Commune of March-May 1871. It was indeed a debacle for the French, and Zola writes about it from the point-of-view of ordinary soldiers, depicting their courage and their suffering as pawns in a tragedy over which they have no control. He began to despair, full of remorse that this was precisely the advice he’d given the day before to General Ducrot of all people, who was now in supreme command. Yes, certainly, the day before that had been the only plan to follow: retreat, immediate retreat through the Saint-Albert gap. But that route must be blocked by now, for that was where the entire black swarm of Prussians had gone, down below on the Donchery Plain. And weighing up folly for folly, there was only one left, a brave and desperate measure, which meant chucking the Bavarians into the Meuse and marching over them to pick up the Carignan road. Not only was there no backup, the incompetence of the leadership meant that the troops were short of weapons and ammunition, horses, firewood to cook with, and worst of all, marching for days on empty bellies. Seen through the eyes of class enemies who become friends, the peasant-soldier Jean Macquart (the central character in La Terre (Earth), see my review) and the lawyer Maurice Levasseur, hunger becomes visceral. They share their last biscuits, until Maurice becomes so desperate that Jean gives him the last one, denying himself altogether. The Emperor is treated with surprising compassion by Zola. He appears in different scenes as a kind of wraith, obviously gravely ill, and although surrounded by his entourage, entirely alone. In the moment of greatest humiliation when he realises that they have lost the war, and that means the end of the empire, he does not even have the authority to surrender to Bismarck. His order to save his people from further suffering by raising the white flag is countermanded by his most intransigent general, who refuses to face reality. Napoleon is a pitiful spectre, denied the right to see his brother King William of Prussia until his generals submit to humiliating terms, and made painfully aware of his change in status by the shabby accommodation he now gets. For the people of Sedan after defeat, there is worse pain than humiliation. Thousands of French troops are corralled on the peninsula with no provisions or medical help. Many of them die of hunger or wounds as the Germans take their desultory time to make arrangements for them. In the town, homes are occupied, and there are desperate attempts to negotiate over the impossible sums demanded in reparations. When the local thugs take every opportunity to kill the Occupiers, there are brutal reprisals against the townspeople. The sound of coarse German songs and their guttural language in the streets reinforces their misery every day. Meanwhile, the enemy’s grip encircles Paris and the siege begins. Again, the people can’t quite believe that it is happening. Previous defeats were accidents of fate, they think, and the invincible French army will be resurrected in the provinces and save them. But as the weeks go by, supplies diminish; the lights go out; there is no fuel for cooking; rationing fails and hunger becomes the silent killer. The enemy waits outside, as negotiations for peace begin. Versailles recognises that surrender to the Prussians is inevitable but in the face of the reality that they have no options left, they haggle for reasonable terms. In the pages of a history book, the rise of the Commune seems incomprehensible. As Jean perceives it, it is madness for a country to be in civil war when the enemy is at the doorstep. But in Zola’s novel, we see in the character of Maurice that the feverish madness which led to the Commune derives from love of country and a desire to rebuild a new nation after the excesses of Empire. The rebels’ refusal to acquiesce to Versailles’ surrender was fuelled by irrational optimism, a hope that succour must come from somewhere – some provincial army, some helpful ally offering more than mere words, and a belief in the Commune as some kind of avenging angel for all the shames endured, as a liberating force bringing the severing iron, the purifying flame. For the modern reader, Zola’s novel brings perspective to the 20th century hostilities between France and Germany. And like War and Peace it reinforces the truth that it is the ordinary people who get caught up in great events who suffer heroically in war. Source: Interlibrary loan courtesy of the Melbourne Library Service via Kingston Library. This edition is out of print. Hopefully OUP will issue a reprint before long.